We just got this new little kitty at the SPCA and what a little cutie he is. His name sure suits him. My 8 year old daughter named him. He is still a kitten at heart but I don't think he is quite a year old yet. We had him fixed because he was starting 2 spray our house when we first got him but he doesn't do that now. He is very clean and playful. We have this beam light that we flash and he goes absolutely crazy over it and he thinks he can catch it with his paws. We got him some toy mouses to and they squeak like a real mouse. We took him to the vet 2 get him fixed that time and I put his squeaky mouse in his cage and while he was there for the day one of the girls that worked there thought she heard a real mouse and the other girl went to my cats cage and brought out the toy mouse. I guess they all had quite a great laugh out of it. My cat will chase his toy mouse around home at night and u would swear it was a real mouse with the squeaks from it. There is more stories I could tell but I will leave that for another time. Comments for My cat "BUDDIE". THANKS EVERYONE...LUV DEB AND BUDDIE. I really enjoyed your "Tales of Buddie". He sounds like a real charmer -- as in Prince Charming! I especially enjoyed the mouse in the vet's office story! My cat has one of those too and her favorite time to play with it is at night too, just like Buddie. Here's wishing your Buddie and your family MANY happy years together. Looking at Buddie, I can almost hear him purring. He is gorgeous and Bless You for adopting him from the SPCA and it sounds like he is showing you his gratitude by bringing your family such joy in his antics! You have more stories about Buddie? As one cat lover to another, I never tire of kitty stories and would love to read more. Thank you and give Buddie an extra cuddle from me, too, please. I think that Buddie is not only sweet but handsome as well. 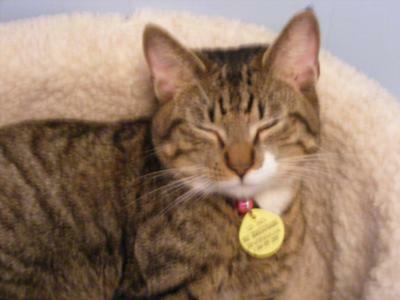 I must confess that I adore tabby cats like Buddie (my two last cats have been tabbies). They look like small tigers, and many also have the attitude to match! I enjoyed reading about Buddie's playful nature. May he have a long and joyful life with you and your family.